In the words of Tim Bertilsson, Swedish band Switchblade has risen once again, but this time 'as a two-headed beast'. After losing Anders Steen after 12 years of recording together, Bertilsson and Johan Folkesson have bounced back by releasing what's been hailed as their best album yet. With a few tricks up their sleeve to fill the gap that Steen has left, Switchblade also invited a guest line up of vocalists to complete the sound. 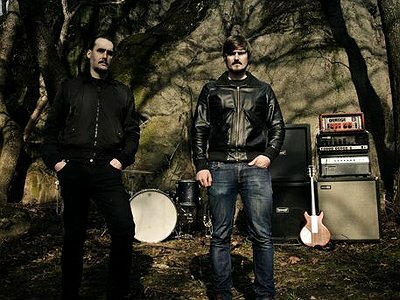 One of the first Swedish bands to join the drone doom dirge, Switchblade continues to rise out of the swell as progressive leaders of the genre with their epic, nameless offerings. I started playing and writing music quite late, which I really regret, in the early/mid 90’s. I started out being influenced by punk bands like Circle Jerks, Misfits, DRI etc. Hmm, that’s a tough question but there are a bunch of shows and recordings that we have done with Switchblade that I feel are extra important. And for me personally, the shows I’ve done with Fear Falls Burning have a special place in my mind as well. At the very moment we’re not composing or producing so there’s no challenges really but we usually just try to not follow any rules when writing. Neither me nor Johan has any musical training which might be good or bad but I think that sets fewer rules in your mind while writing music. It’s usually just a guitar riff or a basic idea of an atmosphere. Rather strict really, at least in Switchblade. There has been no improvising at all in our music up until the latest album where there are some small bits of improvising here and there. I think that they're all connected and one can’t exist without the other. No, not really. We don’t feel that the audience should interpret the music the exact same way as we do. We leave it open for the listeners to make their own interpretations and make up their own visuals in their minds while listening. I’m not sure. It’s hard to really know how others perceive sounds but I hope that cultural differences don’t effect people’s perception too much. I think that most of those art forms have been related for quite a long time but yes, quite a lot of artists are using other forms of expression to increase the impact of their music. I think that feeling and seeing music is quite important whether it’s in the form of packaging or a live show. I’m definitely more into the complete package with a nicely presented and designed album. But I do think that the digital side of it is a necessary supplement these days. I don’t think too much about things like that and just try to do what we do in the best possible way with whatever funds we have really. The way that people find music and get force fed is quite different today and I guess it's for both good and bad. People tend to give each new music encounter a lot less time, so you need to give an impression in a short period of time. Which isn't always that easy with the kind of music we make which craves patience and concentration from the listener. If any form of music reaches a wide enough audience it would be considered mainstream, wouldn’t it? Our music and our creative work have always been more or less for our own pleasure and we have not really tried to reach out to an audience. Positive reactions and people supporting us by coming to shows or buying our music has just been a nice bonus. But yeah, with the steady stream of music being shoved in your face, the listener today has to sort through a lot more before finding something that’s worth exploring deeper. But the process of finding new music is so much faster today compared to just 15-20 years ago. It differs from company to company and probably within genre to genre as well. But with such a big flow of bands and albums, promotion is very important if you want to reach potential listeners. It’s very easy to fool people that a band is a lot more popular by doing an aggressive promotion campaign. You should check out the Swedish progressive band Gösta Berlings Saga and the Norwegian death metal band Obliteration.